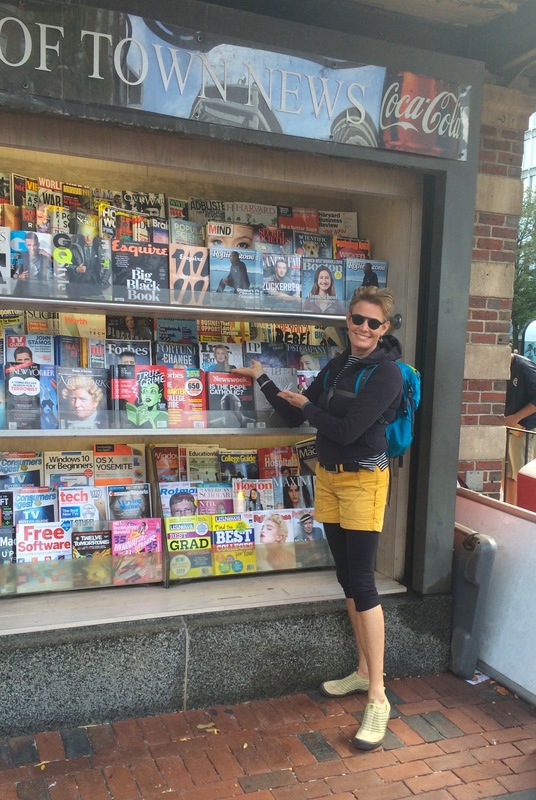 Me at Out of Town news in Harvard Square. Feeling goofy, but also happy, while taking the photo. When Leigh interviewed me she kept coming back to the question of “Why is Grommet not better known?” While 1 in 50 American households follow our daily launches (we can see that in our email metrics), there are 49 others who may not. I see that as opportunity, not failure or even disappointment. I guess if I had to point to a couple reasons for our not being ubiquitous, though, they would center around our “doing it the old fashioned way” in terms of earning our business inch by inch. Secondly Joanne and I are not the 19-year-old college dropouts that make favored media subjects–including the cover of this issue of Inc. magazine! 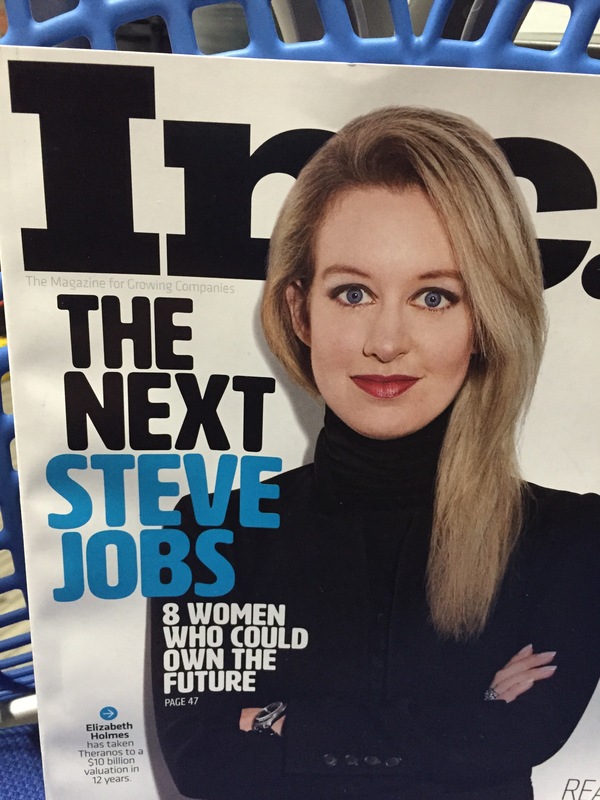 Nothing against the founder of Theranos–I am in awe of her. But the press always gravitates to the “wunderkid” over the knowledgeable veteran. Go figure. I am just grateful no one printed the nonsense I would have spouted in my twenties, and that our story–today– was one of the Inc. magazine eight! Here is the article in its entirety, and including a couple corrections that are footnoted. As an industrial designer, Pieri reveres craft. As a Harvard MBA, she understands strategy. In 2008, she and co-founder Joanne Domeniconi hatchedthe Grommet to bring strategy to craft’s rescue. (2) Since then, the company has been on a mission to forge the maker movement’s disparate, idiosyncratic community into a major economic force. The Grommet is a product-launch platform. Weekly, its staff chooses seven products from 300 contenders, vetting not just for appeal and quality but also for obscurity. Weekdays at noon, the site unveils these products, organized into nine socially conscious categories, such as Made in the USA and Underrepresented Entrepreneurs (for example, those over 65). Last year the company launched a wholesale channel; an even newer venture positions it as an intermediary between a few major retailers-;including Anthropologie, CB2, and Staples–and makers without the operational muscle to handle such accounts. For a company with Industrial Revolution-size ambitions, it has remained strangely under the radar. Pieri has raised $4.5 million from angels; the not-yet-profitable business projects 2015 revenue of roughly $35 million. (1) Leigh Buchanan did such a good job writing this piece that I hate to quibble. But I was never a VP at Playskool. I consulted directly to Meg Whitman, who was President at the time. (2) I do revere craft in my personal life and purchases. But we did not set out to rescue craft with The Grommet. Joanne and I have deep expertise in manufactured products. Only about 5% of Grommets would be considered craft. We do love them, but we mostly leave handmade products to be associated with the rightful owner of that space: Etsy. That’s fine with us. Craft products are not scalable enough for our business. It’s a well crafted piece. Even post YC demo days the companies usually lull and fall off. That’s one of the issues with Kickstarter. You build up that momentum and at the height of the momentum you stop marketing.